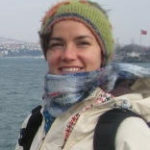 During the mid-15th century, Constantinople was the center of the civilized world; the original melting pot. 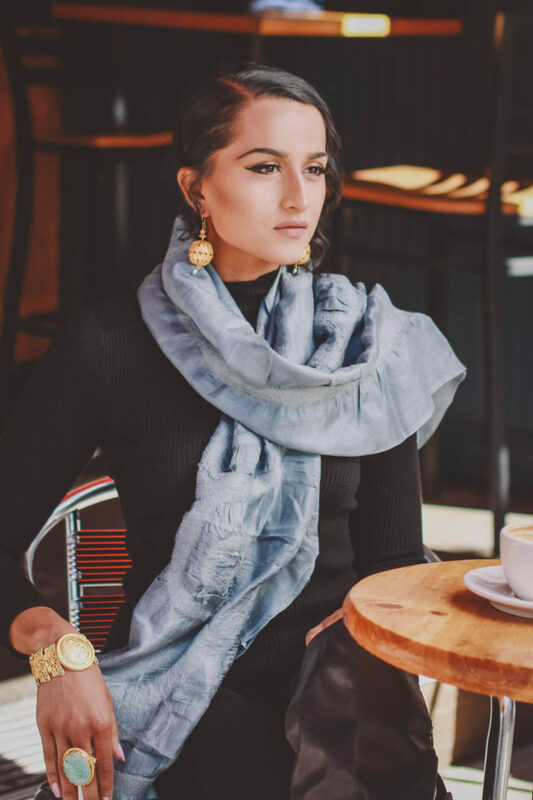 As such, the symbolism and styles originated therein continue to speak to each of us, as we intrinsically connect with our own cultural heritage. 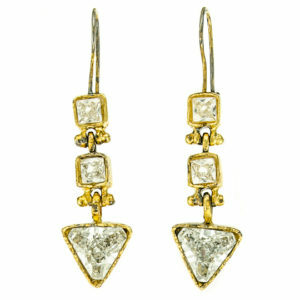 These fantastically distinctive earrings are named for the Pamukkale World Heritage Site. The branched design mimics the terraced landscape, while soft aquamarine represents pools of the same hue that form all along the area’s white travertine deposits. 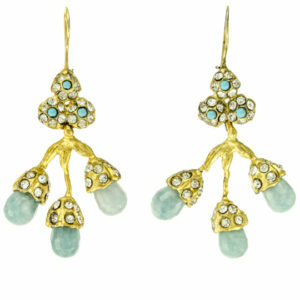 With added splashes of turquoise and clear crystal, these earrings capture both the fantasy and majesty of Pamukkale. 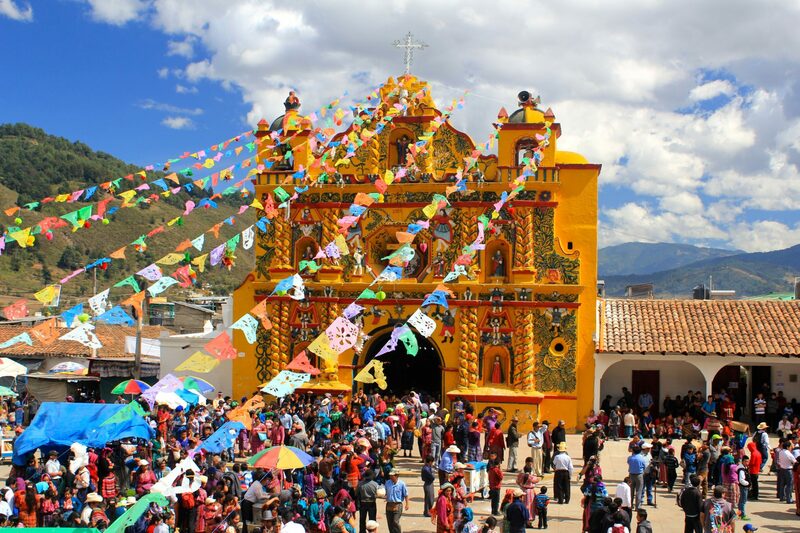 Set on a vibrant gold-plated base, turquoise and red cubic zirconia capture the striking façade of the church of San Andrés Xecul, Guatemala. We love colors of Central America, which make appearances across architecture, fashion and food, making every day feel like a fiesta. Too busy to be bothered with trends, Spartan women wore the side-opening peplos garment much longer than other Greek societies, earning them a reputation as phainomērídes, or “thigh-showers.” This bronze statue, dated around 500 B.C., shows the Spartans’ priority for function over fashion. 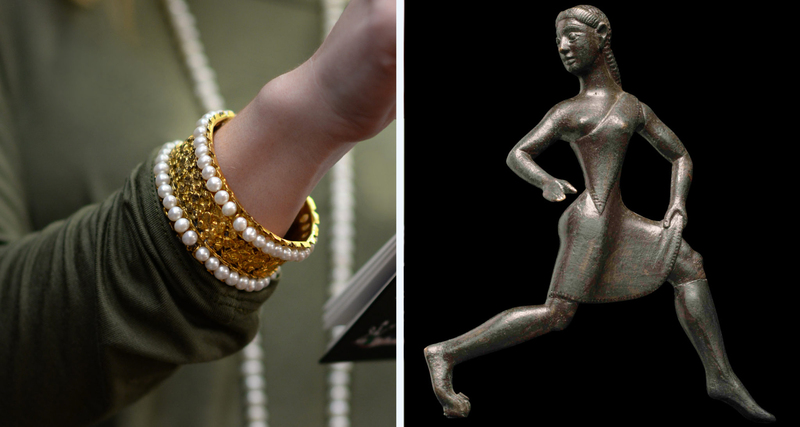 Like the peplos, this handcrafted gold-plated cuff rimmed with pearls, makes a statement with its simplicity, and seeks above all to accent your own unique beauty. It’s a versatile, timeless piece that – like gorgeous thighs – will never go out of style! Lace up jackets may have originated as standard-issue for military officers, but distinctive style has a way of catching on. 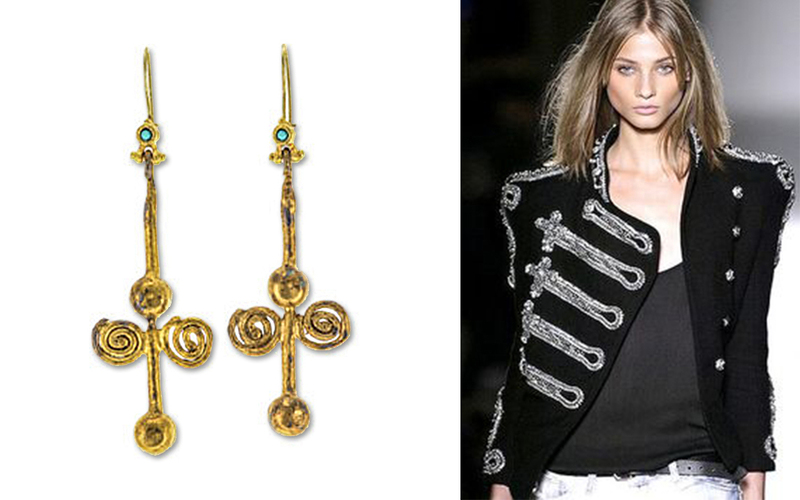 These distinctive earrings draw inspiration from the lace-up jackets of the imperial battalions. Their alluring design yields a modern edge, inspiring current fashion from our own Battalion earrings to this fantastic Balmain military jacket. 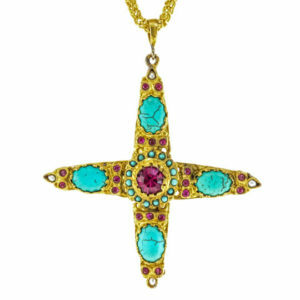 The Sumela Heights Necklace draws inspiration from a striking old-world monastery, perched in the cliffs above Trabzon. 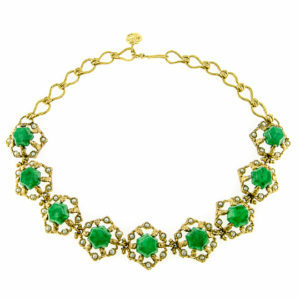 Nine verdant jade stones sit enthroned in gold-plated halos with touches of pearl, all on a handmade chain. 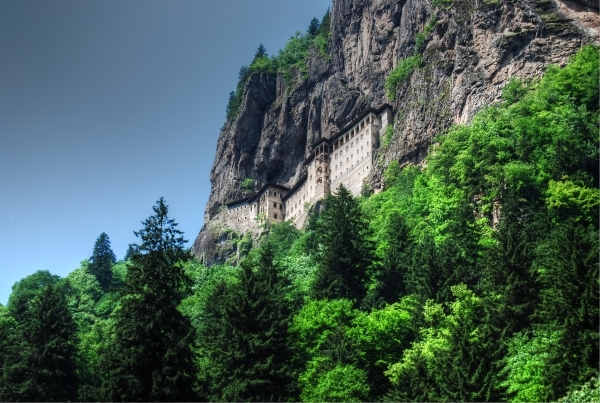 The striking design captures the combination of natural beauty and man-made wonder evident in this historic landmark. Several rooms in the palace of Versailles are named for mythological gods, but the Apollo room was especially luxurious, perhaps because King Louis XIV was known as the Sun King. 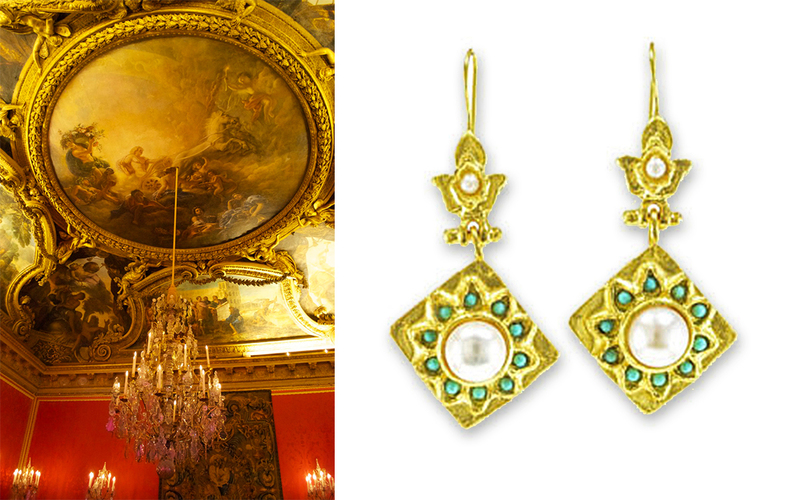 These gorgeous earrings, with their blazing gold-plated coronas, remind us of the opulent Apollo Room and Sun King motif found throughout Versailles. 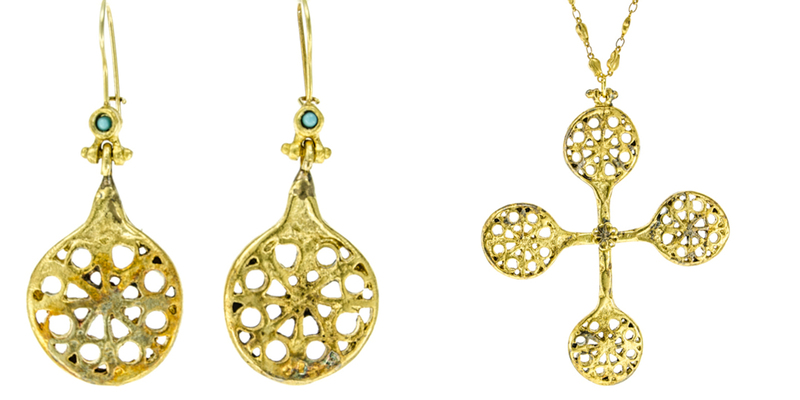 This fine necklace and its matching earrings are inspired by the lotus root, or “renkon,” an auspicious symbol and food used throughout Asia. 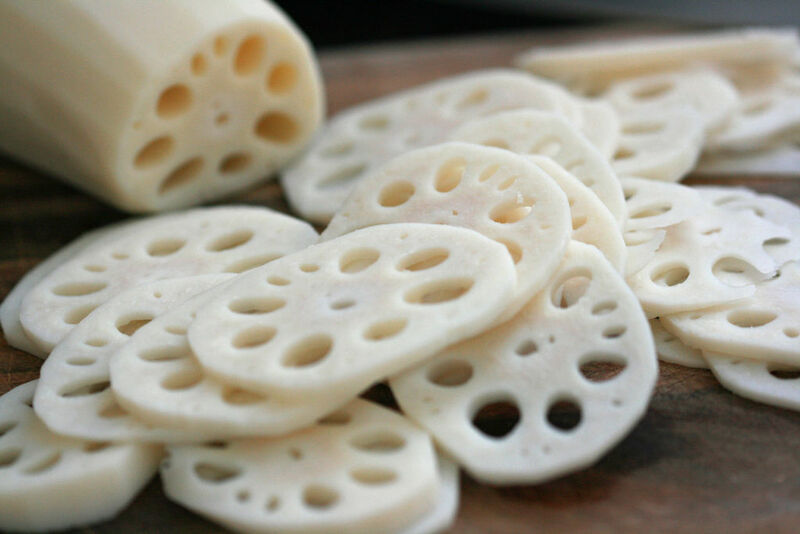 Lotus root is traditionally eaten for health, and believed to bring abundance in the new year, while its many holes represent a mind that is open to new ideas. 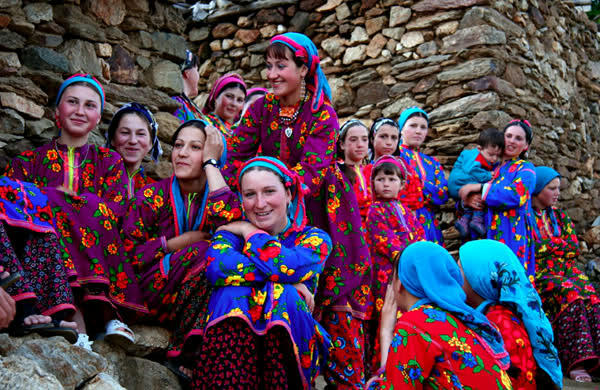 First hand accounts of the Yörük people point to their strikingly cheerful deportment and strength amidst a decidedly unstable lifestyle. 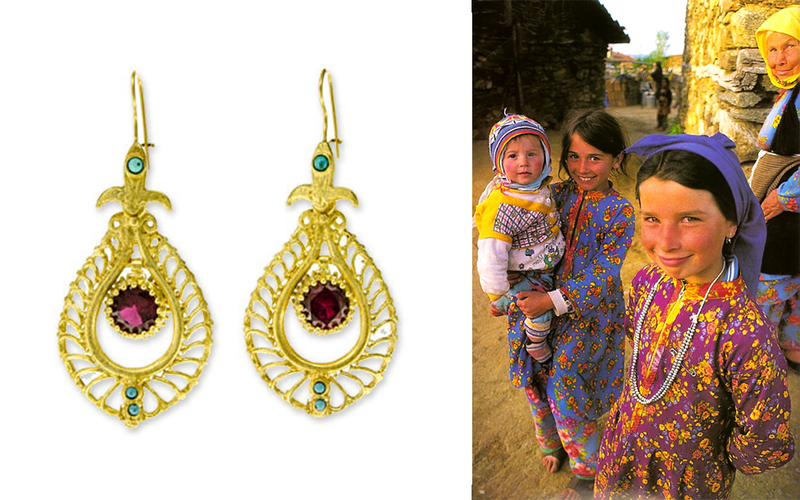 The rich red crystal centerpiece of these hand-crafted earrings, with turquoise on a bright gold-plated setting, alludes to the traditionally colorful clothing worn by the nomads, which seems to reflect their joyous spirits! During the 16th Century Ottoman era, master embroiderers were important members of the royal court. 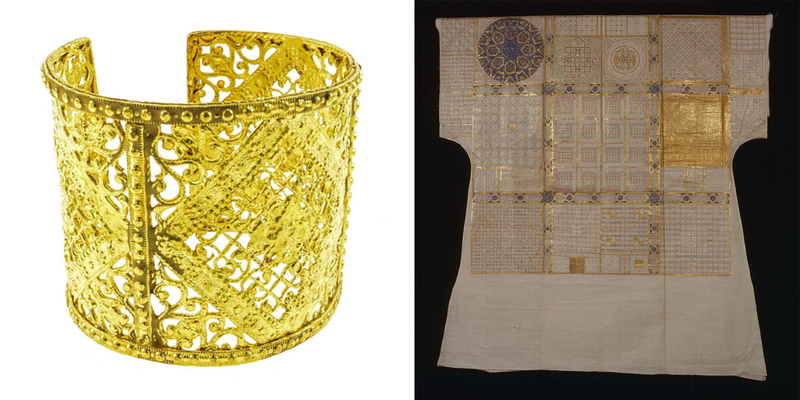 One group, the Cemaat-i Zerduzan, worked almost exclusively with gold threads, and their embroidery technique came to be known as “zerzud.”  The gorgeous filigree design of this hand-crafted cuff mimics the embroidery seen on textiles from this era, including this kaftan which is featured in the palace museum. 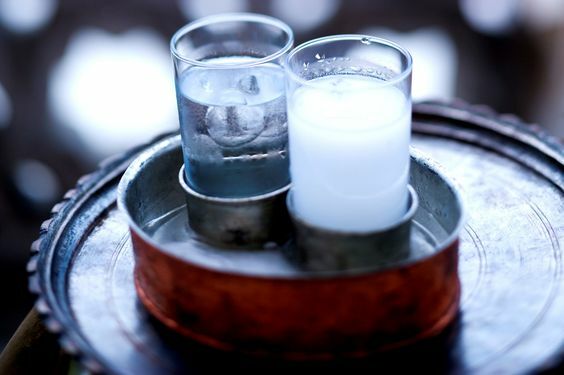 Rakı is a clear anise-flavored alcohol, traditionally served chilled and sipped alongside small meze plates and frequent toasts. The cool, clear crystal set in these handcrafted earrings convey both the festivity and subtle delicacy one must feign while sipping strong rakı!